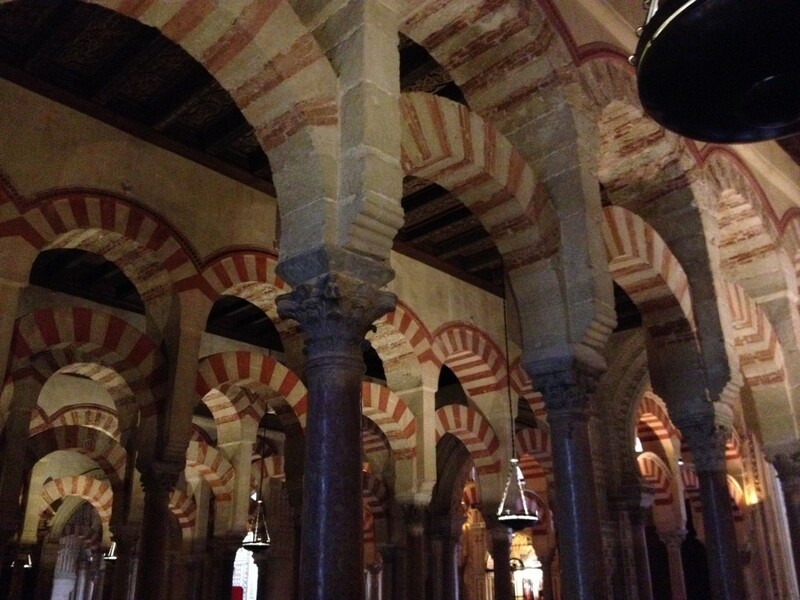 We left early Thursday morning for our trip from Madrid to Andalucía, one of Spain’s largest autonomous communities, located along the southern coast of the country and dominated by its Islamic history and influence. This will be a very long trip — from Thursday morning until Tuesday night — but on it we will be exposed to many different places in the Iberian Peninsula, such as the cities of Córdoba, Granada, and Sevilla in Andalucía and Lisbon in Portugal. Fortunately, because this trip is included in the Iberian Experience kids’ study abroad program, all of our AU classes are canceled this week, so I don’t really have homework and I only miss one ICADE class! All of us boarded the bus at 9:00am and started on our trip southward. It’s a long way down to Granada, where would be spending the next two nights, but luckily the journey was split up with some smaller stops along the way in Consuegra and Córdoba, and of course lots of talking, a short coffee-bathroom break, and even a movie. 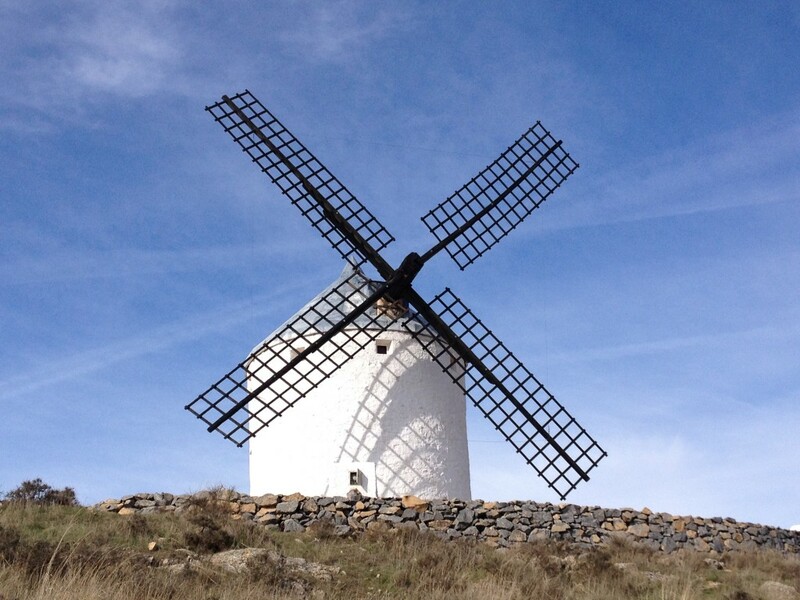 One of the novel’s most famous scenes occurs early on when Don Quixote tilts at windmills, jousting them because he thinks they are evil giants, so we naturally had to visit a windmill while there. 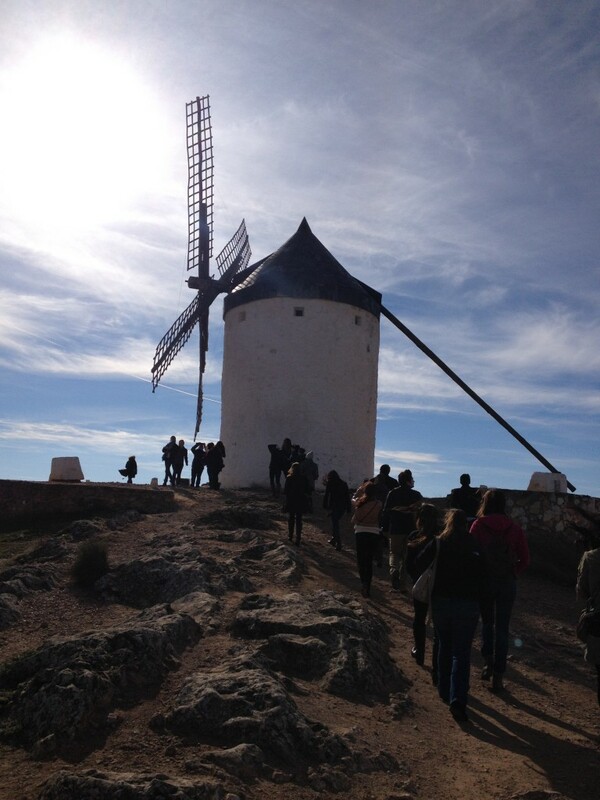 We went up to the top of a hill above the city to a group of twelve or thirteen windmills, or molinos de viento, along with a castillo or castle. It was very cool to see the old windmills that were built in the same time period as the novel from 1605 and that are still functioning and grinding up grain into flour today. It turns out that those windmills can actually also turn to face the wind in whichever direction it is blowing; there are windows in the windmills that blow open if the wind is blowing from that direction so you can move the blades to the best position for those particular wind gusts — a very cool technological feat for something from such an old time period! After seeing the windmills, we hopped back on the bus. 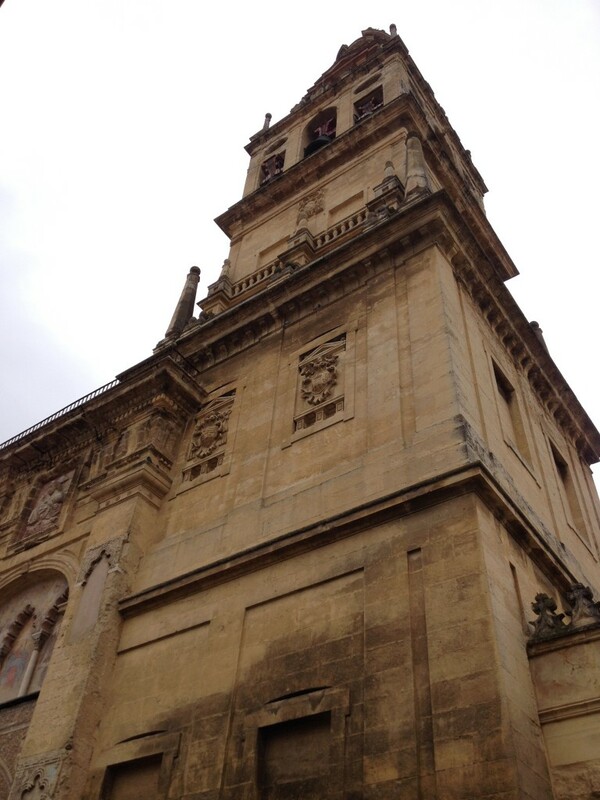 Apart from a quick stop to use the bathroom and get a coffee break in Puerto Lápice (where we discovered the delicious Spanish version of Nesquik: Cola Cao), we drove straight to Córdoba. Along the way we saw many olive trees, vineyards (bodegas), solar panels, and even signs for Manchego cheese, a cheese made from sheep’s milk that can only be officially called that if it comes from the region of La Mancha. 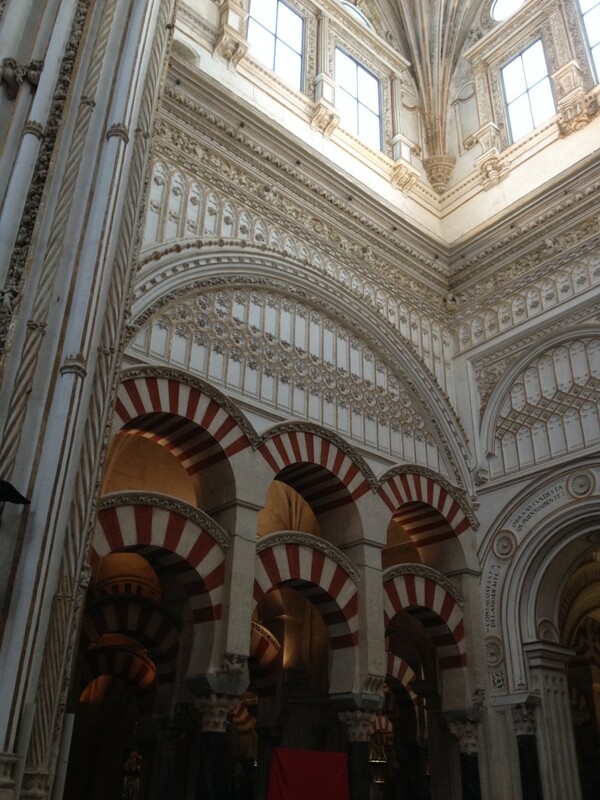 Two more hours of driving later, we eventually made it across the border to Andalucía and arrived in Córdoba, the former capital of the Muslim-ruled Al-Andalus that made up a large part of the Iberian Peninsula from the 700s until 1492 when the Catholic Monarchs reconquered Grenada. At its peak in the 10th century, Córdoba was the most populated city in the entire world with over a million inhabitants. Our destination there was the huge former mosque in the middle of the city that has since been converted into a cathedral like most Spanish mosques from that time period. The mosque was a pretty amazing sight, with its hundreds of beautiful arches, colorful patio filled with trees, fountains, and oranges, and very interesting history. Because it was originally a mosque, the architecture differs a lot from many of the Christian cathedrals that we have seen, with limestone and brick being used instead of the heavy granite that is very difficult to manipulate and with most of the construction being made with reused materials to speed up the process. 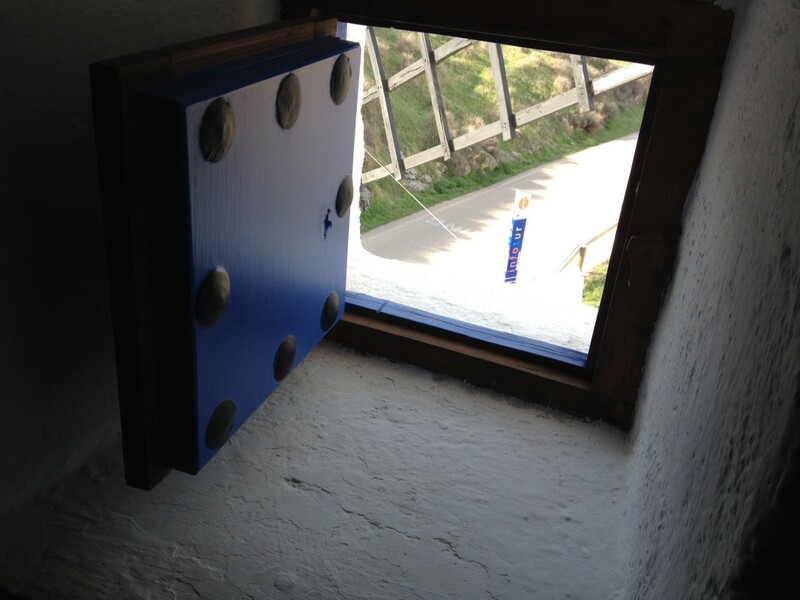 They continually had to expand the mosque as more space was needed, so anything they did needed to be very practical. 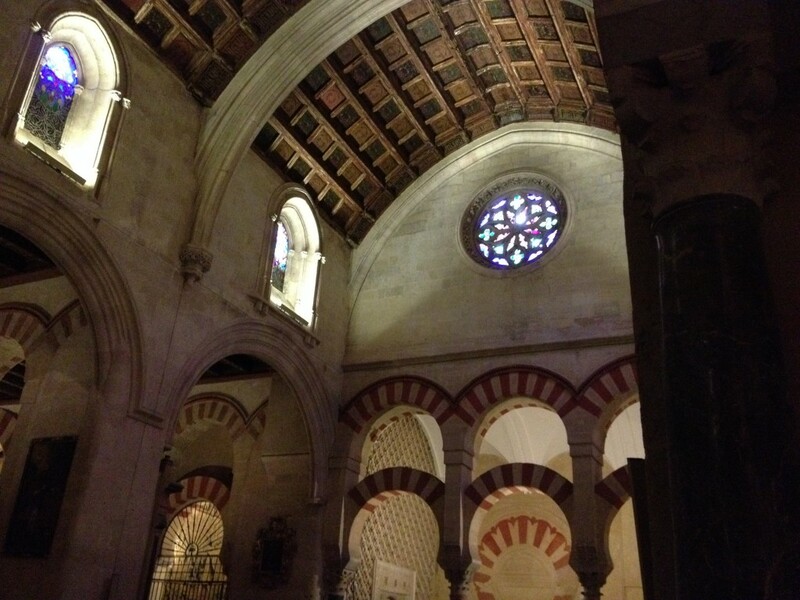 After excavating the area beneath the mosque a few years ago, they actually found out that it sits on the site of both a former Roman temple and a Visigoth church. Because it is a cathedral today, Paco pointed out that that means the exact site we were standing in was used for holy places for four different religions and millions of people; it was amazing to think of how many people, religions, and generations have used that spot for religious worship over the years. 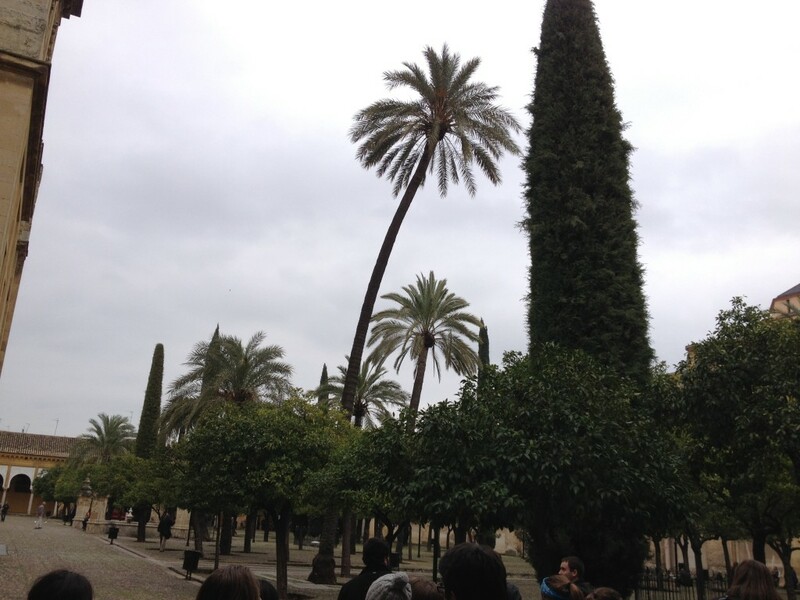 I can definitely see why we visited the Mezquita de Córdoba. Obviously, its huge size and importance for the former Muslim state before Spain existed require a visit. However, it is also different from any other place in the world because when they converted it into a cathedral, the Catholic Monarchs just added a huge cathedral in the very middle of the existing mosque structure, so as you are walking around within it you randomly walk a little further along and pretty much see a Catholic church appear out of nowhere. In addition to this, the mosque is probably one of the only ones in the world that does not point towards Mecca like mosques are supposed to. Córdoba’s mosque really is a very unique structure unlike anywhere else in the world with the combination of different cultures that we’ve come to expect from all we’ve learned about Spanish history. 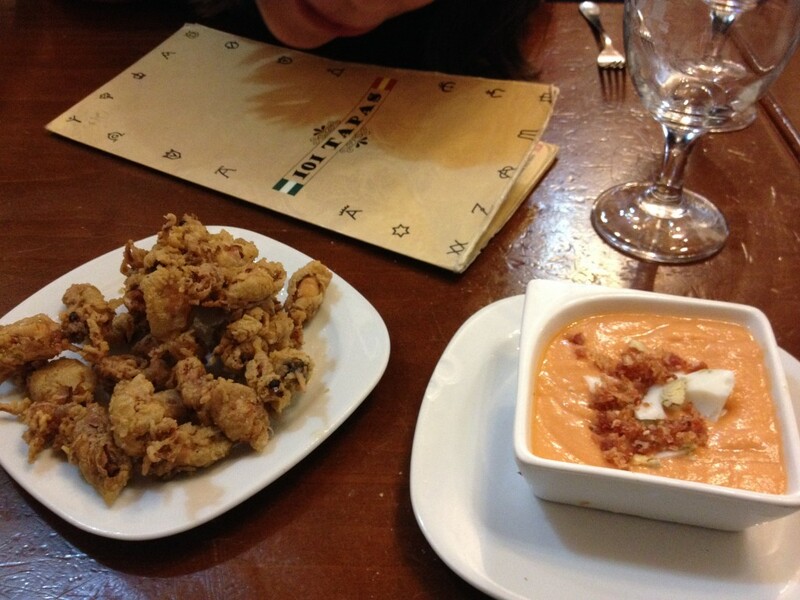 We finished up at the mosque and had some free time for shopping and food, where we ate some tapas that are common to Andalucía: chipirones fritos, or fried baby squids, and salmorejo cordobés, a cold creamy tomato puree with cured ham and boiled eggs. After leaving Córdoba, we still had two and a half hours until we arrived in Granada, so Paco put on a movie that he brought from home: La piel que habito (The Skin I Live In), a film by Pedro Almodóvar, probably the most famous contemporary direction in Spanish cinema. I’d seen the movie before, and it’s definitely on the strange side, but I understand why Paco picked it… because of how important he is, no trip to Spain is really complete without watching a few Almodóvar movies! If the first day is any indication of how the rest of the trip will turn out, we’re definitely in for a very exciting trip that’s jam-packed with lots of activities. Not to be sappy, but it never ceases to amaze me how lucky we are to be experiencing and learning so much. The best part is that we’re not just staying in Madrid but are actually getting to know other places in Spain, something that is very vital considering how different the regions of Spain are. As much as we love the city we call home, by the end of the semester we will definitely be able to say that we studied abroad in Spain, rather than just Madrid. 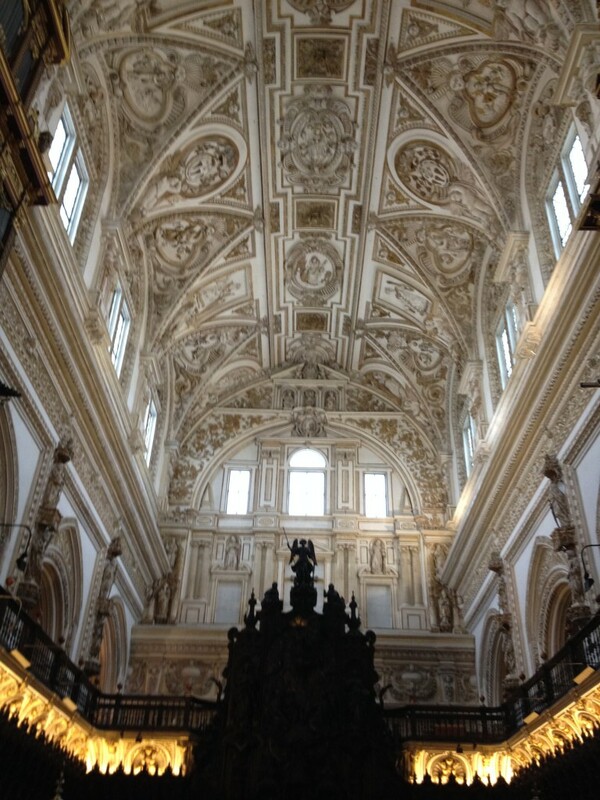 This entry was posted in Study Abroad in Madrid and tagged al-andalus, almodóvar, andalucía, andalusia, bodegas, calamari, castila-la mancha, castilla, cathedral, catholic, catholic monarchs, catholicism, cervantes, cheese, chipirones, chipirones fritos, cola cao, consuegra, córdoba, don quixote, es, film, food, granada, harry potter, iberia, iberian peninsula, islam, islamic, la mancha, la piel que habito, lisboa, lisbon, manchego, manchego cheese, mecca, mezquita, mosque, muslim, paco, pedro almodóvar, portugal, pt, religion, reyes católicos, roman, rome, salmorejo, salmorejo cordobés, sevilla, skin i live in, spain, squids, trips, vineyards, visigoth, windmills, wine. Bookmark the permalink. What an amazing start to your trip! Did you know that we had a dog when I was younger whose name was Dulcinea from Don Quijote?